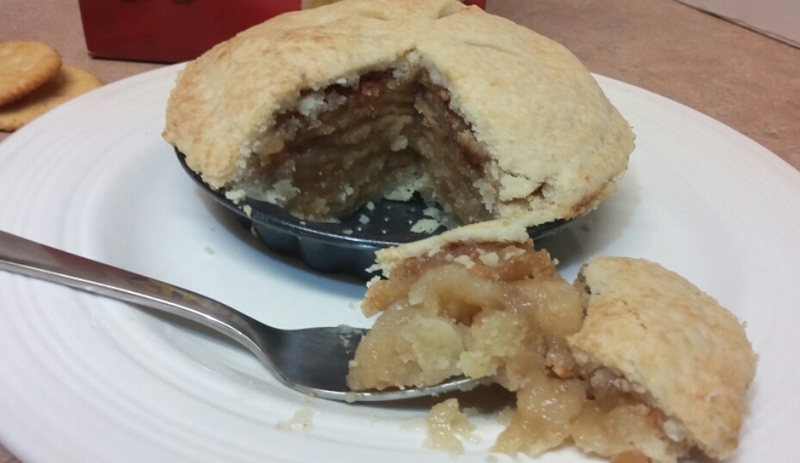 April Fool’s Food: Sky High Apple Pie (Fruit-Free Version)! Pie! For realz. But no realz apples. Apple Pie! Is it or isn’t it? In fact…it isn’t! It looks like Apple pie (it fooled the DH) and tastes like Apple pie (there’s some serious chemistry behind why), but…it’s not apple pie! It’s actually made out of crackers, with lemon juice, cream of tartar, sugar, and cinnamon. The cream of tartar tastes slightly acidic and fruity, and helps the crackers hold their shape so that they look like sliced apples. In addition to the acidic and fruity cream of tartar, the cinnamon and lemon helps trick our brain into thinking it’s apple pie. I first came across the recipe in “The Morningside Papers”, a book by Peter Gzowski. Apparently, though, the recipe has been around for over a hundred years in various forms, with some people saying it was developed by pioneers travelling west across North America who didn’t have access to fresh fruit, but did have access to hardtack (a super-hard type of biscuit with a super-long shelf life). How these pioneers had access to lemon juice, I don’t know, but maybe they used apple cider vinegar or some such thing. Putting it all together. Or should I say…putting on the Ritz! Tee hee hee! But my recipe is easy! 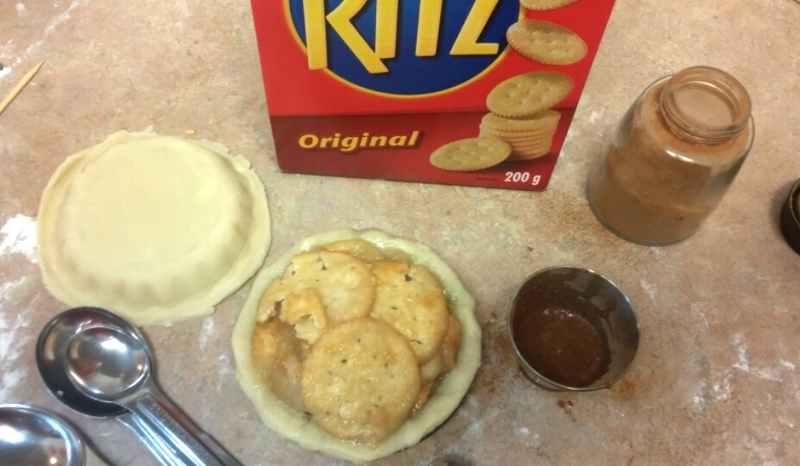 I used Ritz crackers, although saltine crackers can be used too. And of course, I used my always perfect vodka pie crust recipe! It’s an easy pie to pull together, really. Just fill the pie crust with crackers boiled in a sugar solution, pour lemon juice over the crackers, and sprinkle some cinnamon on top. Bam, DONE! Ok, it’s a teeeensy bit more than that, but not much! Want to make some yourself to fool unsuspecting apple pie lovers? 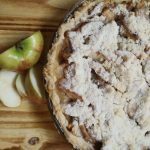 Here’s the recipe to make a small (but not tiny) single serving apple pie, made in a fruit tart pan. Roll out pie crust and fit into two tart pans. Mix water, sugar, and cream of tartar together and boil. Once the mixture has boiled, add in the 13 crackers and simmer for a minute or two. The crackers will start to look fuzzy and possibly disintegrate a bit. That’s ok! Place sodden crackers into one of the pie crusts. It should fill it to heaping. Poke holes in the filling, and carefully pour a mixture of lemon juice and cinnamon over the pie. 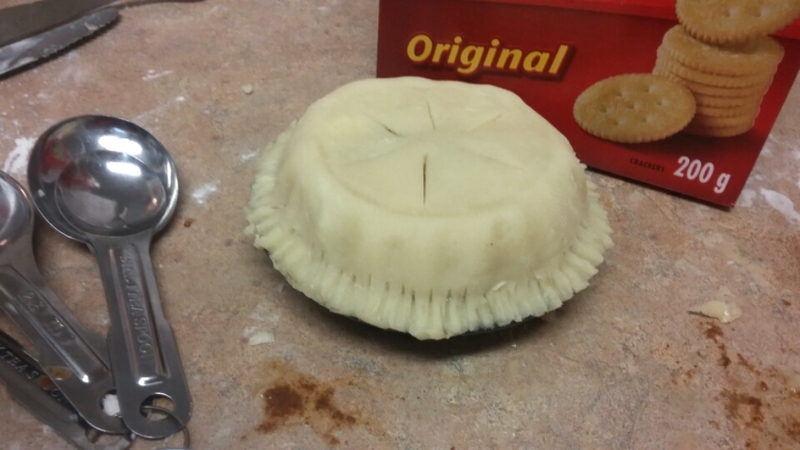 Put second pie crust on top and use a fork to press the edges together. Cut some slits in the top for the steam to escape. If you want a fancy looking pie, you can brush a beaten egg over the top, and then sprinkle it with large grain sugar. It’ll give it that fancy-pants look! Bake in a 350 degree oven for 15 minutes or until golden on the outside. And…does it taste like apple pie? It really does! I gave a slice to the DH, and he agreed that it was good apple pie. 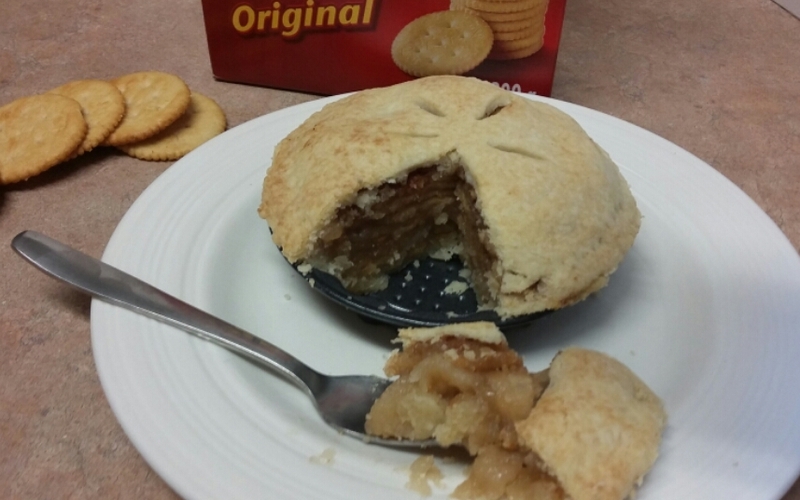 Even though he had seen me taking photos with the Ritz cracker box, and even though I had been telling him that I was going to bake with the crackers, he still didn’t believe me when I told him the apple pie was actually cracker pie. DH: What? Really? No! Look, I see apple! Me: No, sweetie, that’s a cracker. DH: No, it’s apple! *pokes at it with fork* See? It’s apple! Eventually he believed me, but ha ha ha! I managed to trick him! So I think you’ll be able to trick your friends and family too! If you do make this pie and share it with people, post in the comments what their reactions are; I’d love to hear about them! Close-up of the apple-icious action! And a Happy April’s Fool’s Day to you all! Next Post: Potato, Potahto…or Buns? That’s right, I’m carb-loading because…carbs are tasty and that’s all there is to say. And one last thing, I’m trying to go viral by linking up with Christy Jordan’s Southern Plate website. It’s an awesome site, by the way! Linking up at Meal Plan Monday. This entry was posted in Pies on April 2, 2016 by Margaret. I waited until it cooled just enough not to scald my tongue. Then, feasting time! 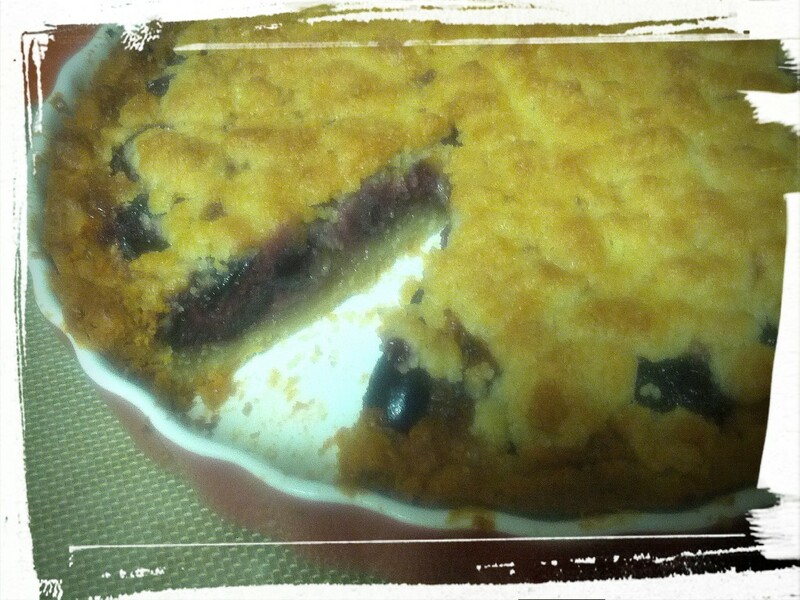 This week’s Baking Chez Moi bake-a-long recipe is for Cherry Crumb Tart. 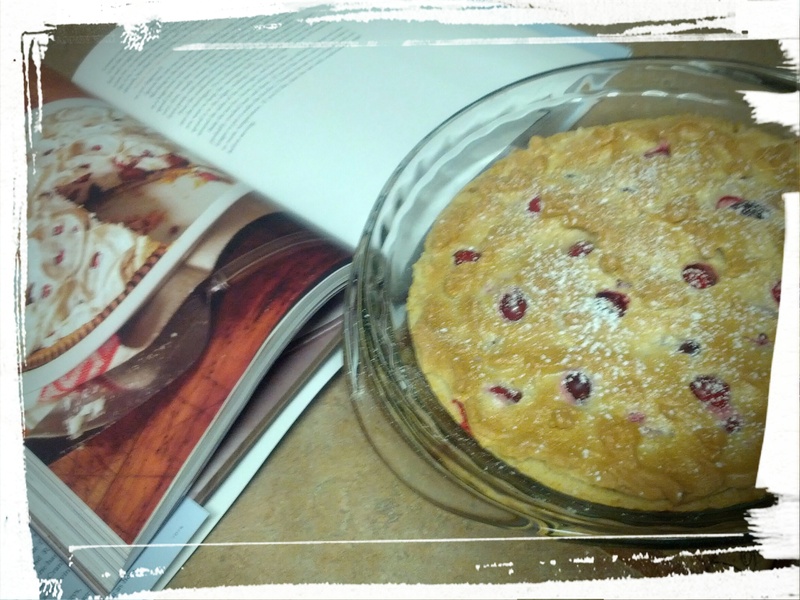 In classic Dorie Greenspan style, she starts off the recipe by describing how she came up with the idea to make a tart with cherries after a drive through Alsace, France. As for me, my strongest association with cherries in baked form is that old folksong, which will now be your new earworm: Can she make a cherry pie, Billy Boy, Billy Boy? 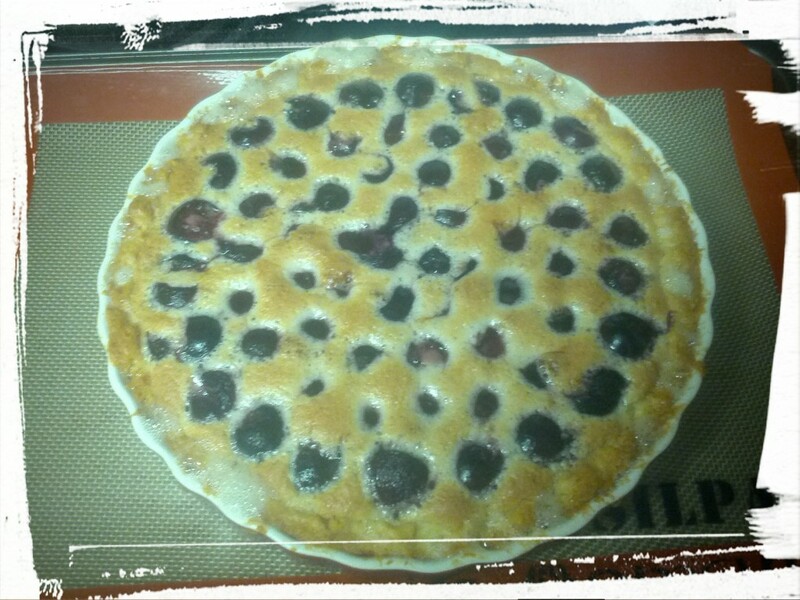 The entire time I was making this tart, I was humming the song to myself, albeit with some mondegreens. Can she make a cherry pie, Pretty Billy? but she’s a young thing, and cannot leave her mother! 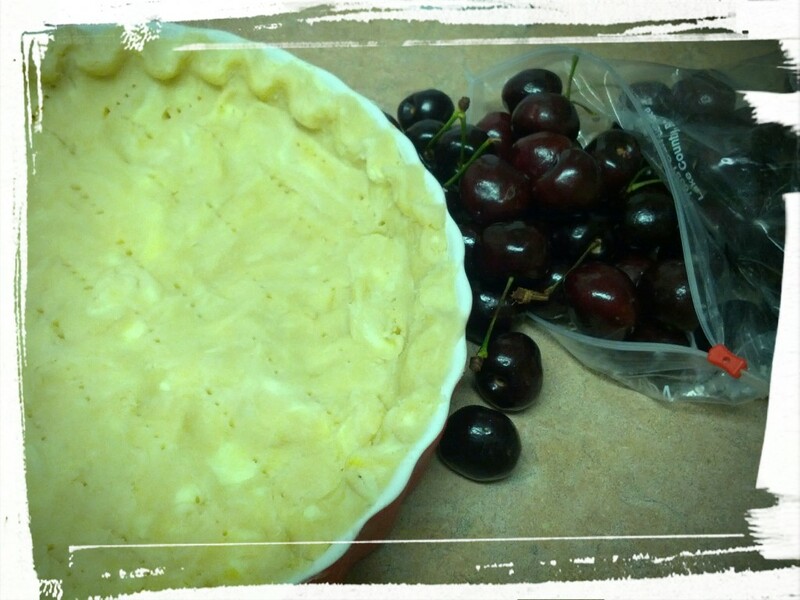 Tart crust plus cherries — it’s a gonna be goot! So. The recipe! You start with a sweet tart dough base, partially baked, and fill it with an almond cream. Dorie suggests using kirsch to really bring out that cherry flavour, or otherwise sticking with vanilla extract. Me being me, I didn’t have kirsch in the house, but I did have some leftover red wine, so I used a capful of that, plus a scant tsp. of vanilla extract. The (raw and eggy) filling was delicious with that hint of red wine! 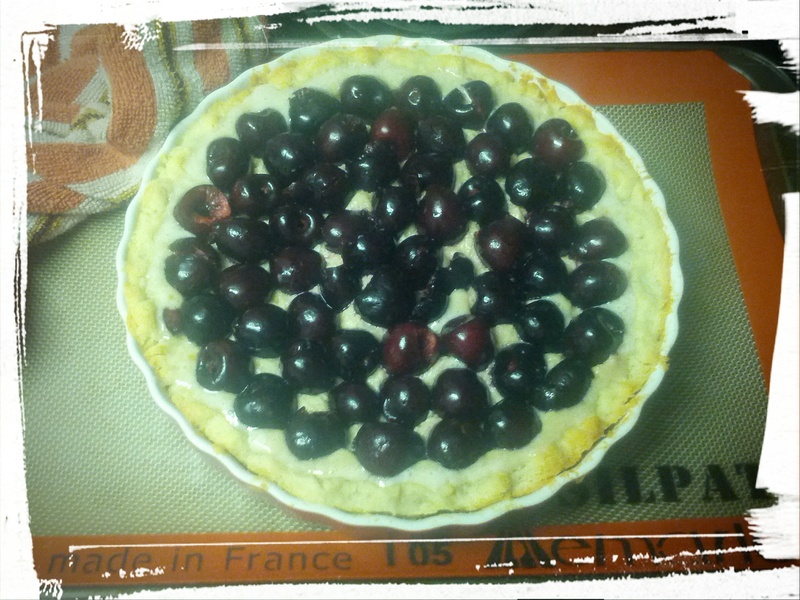 On top of the almond cream-filled tart, you place a layer of fresh cherries. Dorie suggests using a chopstick to pit the cherries if one doesn’t have a cherry pitter. The idea is to keep the cherries whole, so one just pokes the chopstick into the cherry to push the pit out. Can I just say that this is a) a brilliant idea, and b) my poor bamboo chopstick will never be the same again. Fresh cherries? Have a LOT of juice. And by a lot, I mean my chopstick is stained a lovely plum colour, as are my fingernails. In fact, both of my hands are sporting a pinkish hue. I mopped up cherry juice splatters from the kitchen island, the sink counter, the tile behind the sink (I was facing the opposite direction, incidentally), the floor, and there were even spatters on my sock-clad feet. At one point, the DH came out of his man cave and exclaimed over the mess I’d made of the kitchen. I chased him out of my working space by threatening to hug him with my cherry-juice stained self and he promptly bolted. Ah, the joys of domesticity! Too much butter. Or, just enough? Once the cherries were placed on the almond cream-filled tart, it was popped into the oven and baked for a good 45 minutes. Then you pull it back out and put on the final layer: the streusel! Back into the oven it goes for another half hour, until the top is golden brown and the cherries are merrily bubbling away in their juices (or in my case, butter. See above). Then it’s time to feast! 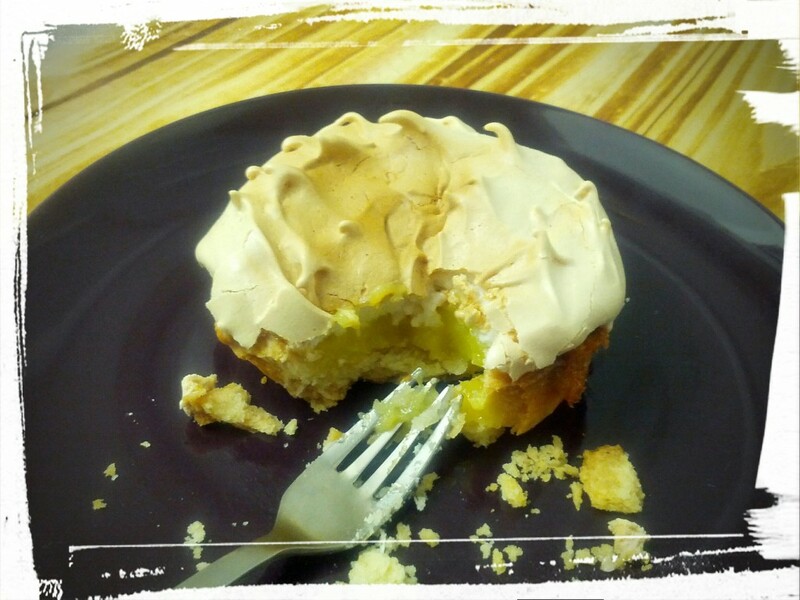 This entry was posted in Cook-a-Longs R Us, Pies on August 11, 2015 by Margaret. Alright, my hearties, I’m back! I took a week and bit off from blogging, so I could focus on getting rid of my migraine. And…it worked! *touch wood* I didn’t stop cooking and baking during that time, though, so I’ve got lots of yummy things to share. First up: my long-promised lemon meringue tartlets recipe. 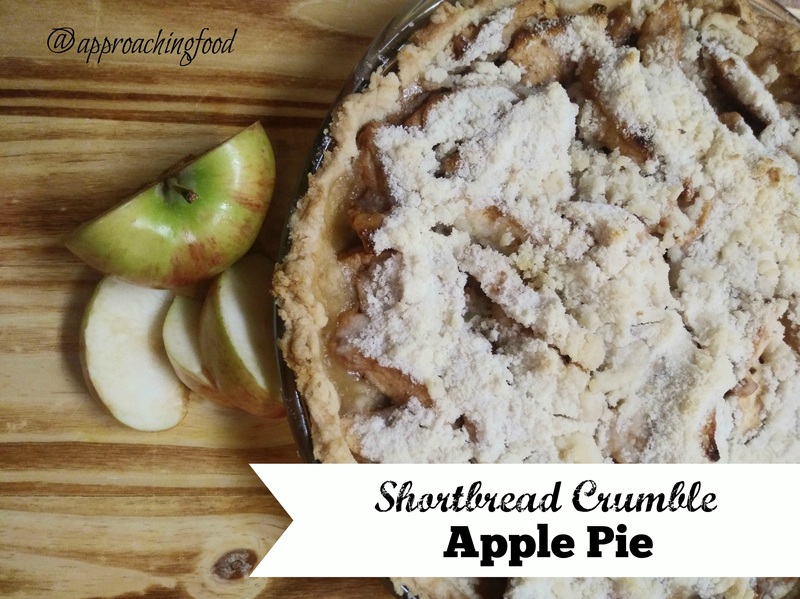 A flaky, buttery crust, that holds together but crumbles satisfactorily in your mouth. Yum! 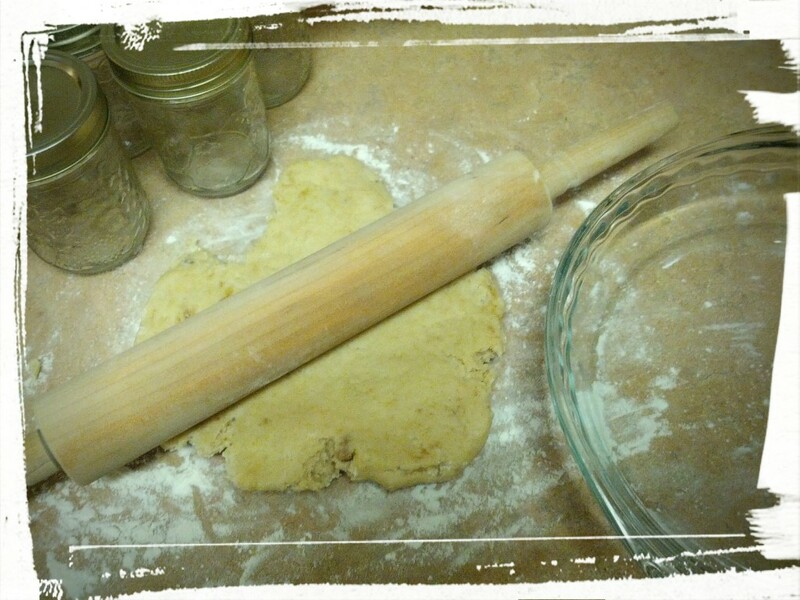 It’s just my vodka pie dough recipe, rolled out, pressed into tart pans, and blind-baked. I blind-baked my tarts at 400 degrees until the crust was golden. Then I removed the pie weights (I used dried chickpeas!) and foil, and let them cool. My vodka pie crust recipe will make enough for three or so tartlets, depending on your pan size. How to blind bake? Easy peasy. Put your dough in your tartlet pans, prick the dough with a fork, cover with foil, and fill with dried chickpeas. You can see a picture in my Pink Grapefruit Tarts post, if, like me, you’re more of a visual learner. Lemon curd, baby! Also known as my new go-to fridge staple. Got toast? Add lemon curd. Got plain cookies? Sandwich with lemon curd. Greek yoghurt? Top with lemon curd. <– Like a healthier parfait! Especially if you layer it in a wine glass with fruit and oat crumbles. Inspired by the Cranberry Crackle Tart that my bake-a-long group made from Dorie Greenspan’s cookbook Baking Chez Moi (run-on sentence much? *takes deep breath and continues with sentence*), I made a meringue topping. But I like it crunchier, more like meringue cookies, as opposed to the fluffy soft, foamy (blech!) usual meringue topping. Beat eggs with sugar until foamy and then add in sugar, salt, and vanilla. Keep beating until slightly less foamy, and most importantly, SHINY! This will take a few minutes. Top the lemon-curd filled tarts with the meringue, and bake in a 250 degree oven until tops are crusty when tapped with a finger, and starting to brown., roughly 45 minutes. Ish. Remove, let cool, and gobble up. Because these things are tasty, sunshine! To sum, (1) blind-bake the tart dough, (2) fill with lemon curd, (3) top with a meringue and (4) bake on a low temperature. Then eat. And savour every flaky, crunchy, soft, tart mouthful. Spring has sprung! In yo’ mouth. Next Post: Nutella. And mini cupcakes. That is all. Post-Pub Edit: As I’m always in search of foodie fame and fortune, I’ve added this recipe to a recipe link-up at Stacey’s Monday Meal Plan recipe gather-up at the Southern Bite site. Check it out here! 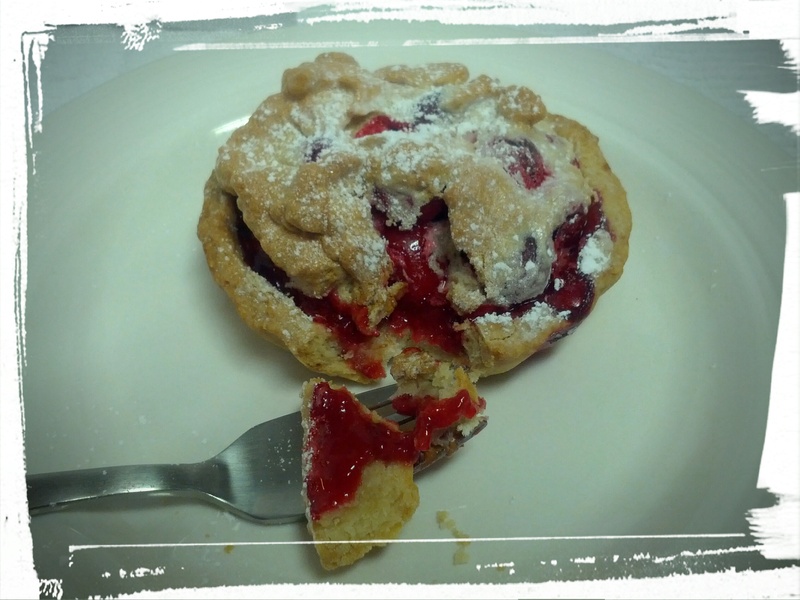 This entry was posted in Desserts Not Otherwise Categorized, Pies on May 10, 2015 by Margaret. 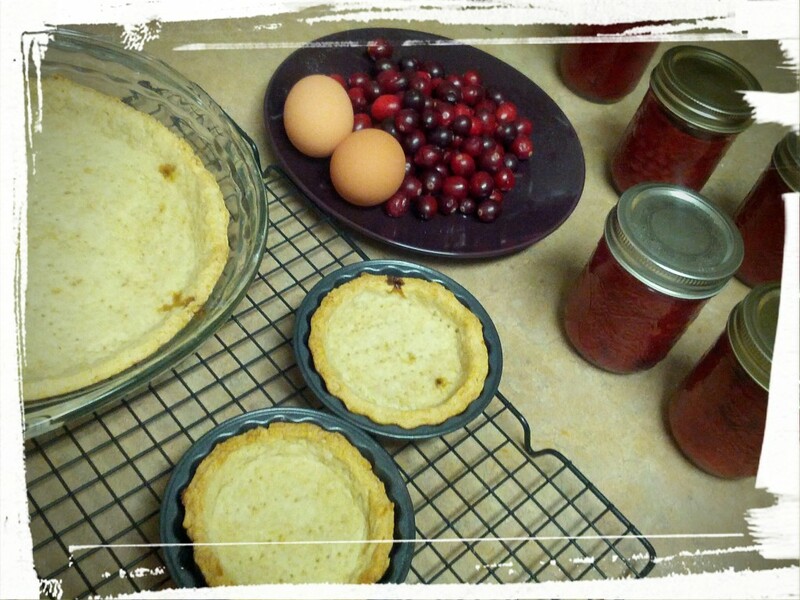 Life of Pie, Part II: Cranberry Crackle Tart and Pectin-Free Jam! Not a mirror image, but still impressive! And most importantly — tasty! Yesterday’s pie recipe was one that I’d be promising you all for a while, but here’s one that I’ve been promising myself for a while! As you know, I belong to an on-line bake-a-long group, baking our way through Dorie Greenspan’s Baking Chez Moi cookbook, and we make a recipe every two weeks. However, early on in the project, I had to miss a week and I’ve been wanting to try that recipe ever since. This Tuesday was Rewind Tuesday with the Doristas, where we got to make a recipe that we had missed, or hadn’t perfected. Since all the recipes I make are perfect (am ignoring the laughter from the peanut gallery, thank you very much), today I’m making the Cranberry Crackle Tart that everyone else made around Thanksgiving. It’s a cranberry-spotted and meringue-filled tart, with a layer of strawberry jam at the bottom, and it looks tres fancy! The first step is the dough. Ignore the lumps of brown sugar. Actually, they were deliberate! Er, yes…deliberate! And of course it wouldn’t be a Baking Chez Moi recipe at my place if I didn’t have to substitute at least one ingredient, and this recipe was no exception to the rule. I didn’t have any strawberry jam, but that didn’t stop me — I just made my own! What I didn’t have though, and couldn’t make, was white sugar. So I used brown sugar, because sugar = sugar, right? Um…maybe, kinda, sort-ish, as you’ll see! First things first. The jam! I had some strawberries in the freezer from when I went strawberry picking back at the end of last summer, so I knew I could make some jam. I didn’t have white sugar though, and I didn’t have enough brown sugar for both the tart AND the jam, so I looked around my kitchen. And…honey! I had honey! That would work, right? 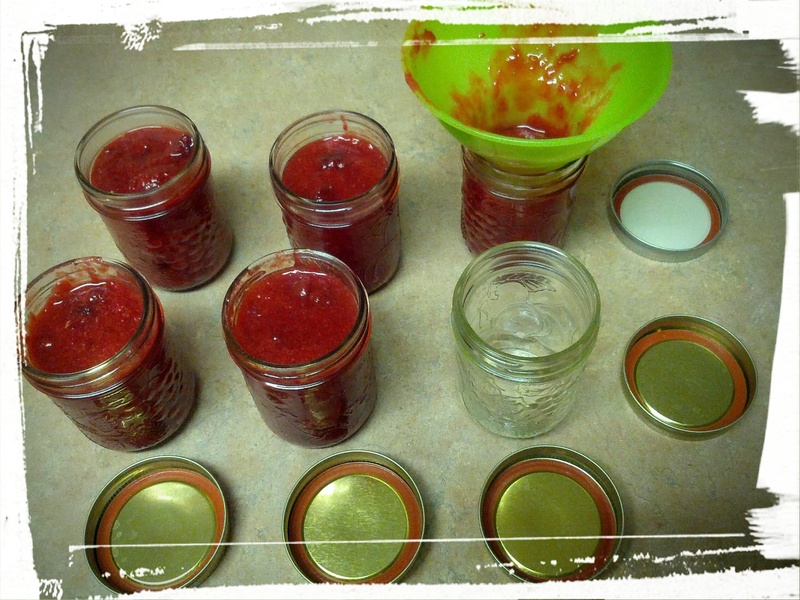 A quick googling of strawberry honey jam resulted in this recipe, from The Nourishing Home blog. The second step: le jam! Hostess gifts, here we come! I wasn’t sure how well the strawberry jam would turn out, but I got to use my new canning funnel for the first time, which made me happy! And the jam turned out pretty well, too. There’s no pectin in it, but the cranberries (!) have natural pectin that helps set up the jam. It isn’t as firm as your standard pectin-filled jam, but I actually prefer it that way. And the mild tartness of the cranberries offsets the sweetness of the honey, so it becomes a more refreshing strawberry jam. I recommend the recipe! I made the tart dough using brown sugar, and then while the jam set, I blind-baked the pie. The dough actually made both a pie and two little tarts. Dorie says to use the leftover dough to make a turnover, but I like tartlets, so two tartlets it was! Then I spread the freshly made jam in the freshly baked pie shells, and whipped up some meringue…with more brown sugar. Step three: putting it all together, while looking farm fresh! Once the meringue was spread in the pie, I realized that I had left out the cranberries from the meringue so I a) panicked and b) dropped them on top of the meringue and pushed them in. It looked fine, so I popped them into the oven, and started the timer. Dorie said to bake it for an hour, but after a half hour, they were quite brown on top so I pulled them out. I’m sure that part of the brownness was from the brown sugar, but I wonder if any of the other Doristas who made this tart found that it browned quickly too. The verdict? I’ll let the words of the DH stand as testament. I told him that I was going to bring in the big pie to my work tomorrow, and plated us each one of the smaller tarts. We sat down and took a bite. Me: It turned out pretty well, huh? Do you like it? DH: No, I don’t think it’s very good. Not enough sugar in the crust. Me: *crushed* Really? You don’t like it? DH: *straight face* No, you shouldn’t bring it to work. I’ll make the sacrifice and eat it all myself. What a prince, ladies and gentleman. A true hero for our times. So yes, was delicious! It’s a nice contrast between tart and sweet, soft and crunchy. I almost wish I wasn’t going to bring it in to work — I sort of want to eat it all myself! Next Post: Not sure yet. Maybe lasagna? I have ricotta cheese, mozzarella, eggplant, zucchini, and noodles. Maybe I’ll whip up a sauce and layer it all together, then share the recipe with you. Mmm, yes, that’s what I’ll do! This entry was posted in Pies on April 1, 2015 by Margaret.